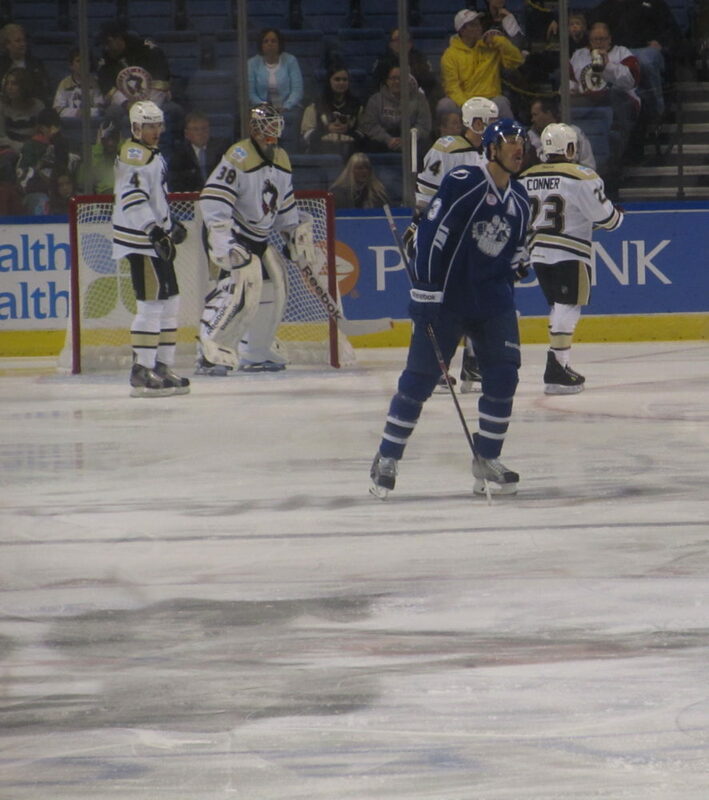 The Wilkes-Barre/Scranton Penguins often do some of their best work while playing from behind, and Wednesday’s game with the Syracuse Crunch looked to be no different. The Pens battled back from deficits of 1-0 and 2-1 to stay in the contest throughout regulation, even taking a 3-2 lead in the third period. But this time, it wasn’t enough. The Crunch tied the game late in the third to force overtime, and eventually a shootout, before taking a 4-3 win and the extra point. Danick Gauthier put the Crunch on the board first just 4:44 into the game on an unassisted tally, and the Pens let their frustration boil over shortly thereafter when Dominik Uher battled J.T Brown on the corner boards. The fight was short-lived, though, and both players received seven minutes worth of penalties. Aside from matching fighting majors, Uher got two minutes for boarding, while Brown served an extra two on a roughing call. Harry Zolnierczyk tied things up at 12:39 off assists from Zach Sill and Simon Despres, but the when Bobby Farnham was off for unsportsmanlike conduct, Nikita Nesterov gave Syracuse back the lead. One of the assists on his goal went to AHL Player of the Week and Rookie of the Month Nikita Kucherov. 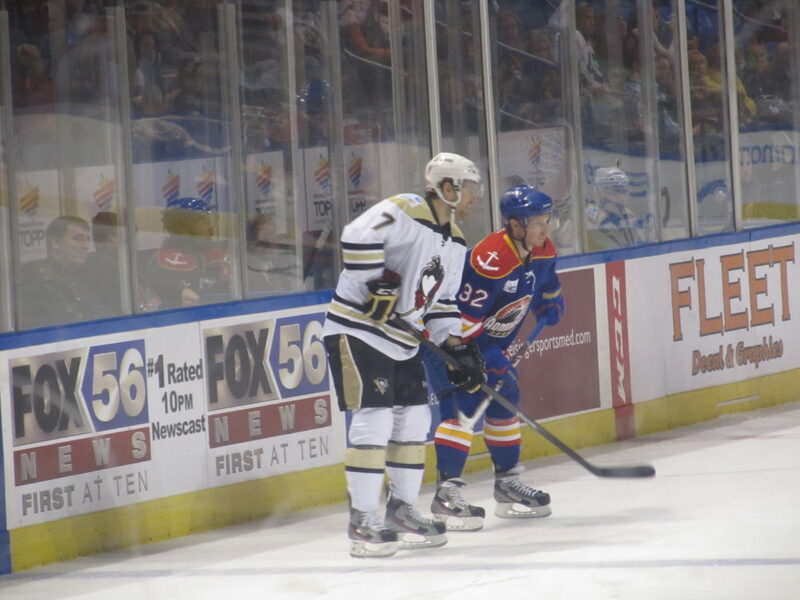 Andrew Ebbett was a key player for the Penguins, scoring twice to knot the score at two and then again in the third period to give WBS a 3-2 lead. On his second goal, he caught Crunch goalie Kristers Gudlevskis out of position and fired the puck into the empty net for his fifth goal of the season. Just under three minutes later, though, Evan Rankin would force overtime, while Gauthier earned another point with a secondary assist. Former Penguins defenseman Jean-Philippe Cote, who played for the team in the 2008-09 season, also helped out on the tally. A penalty shot was called in WBS’ favor at the 37-second mark of overtime, but Zolnierczyk fell a few inches short of getting the puck past Gudlevskis. The back-and-forth action continued until the shootout, where Syracuse’s first-year goaltender stopped all four Penguins shooters. Kucherov and Tanner Richard were able to get past WBS goalie Jeff Deslauriers to take home the win and give the Pens their second shootout loss of the season. Uher went down in the third period with what appeared to be a leg injury. He was helped off the ice by the Pens athletic trainer and a teammate and did not return to the game. Walker is struggling with Syracuse to open the year, as he has one assist through 11 games. Mormina, an alternate captain, has the same total to go with 16 penalty minutes. The Penguins will take on the Albany Devils at home on Friday, November 8. The Crunch will stay on the road and head to Norfolk to take on the Admirals in two games this weekend.